The Layer Transform tool lets you show or hide the translation control, flip, rotate, translate and scale a selected layer. You can also animate layers by setting keyframes and then fine-tune them using the Function Editor. NOTE For tasks related to this tool, seeAnimating Layers. Shows or hides the translation controls in the Stage view when using the Layer Transform tool on a layer. The controls are displayed by default. Shows or hides the rotation controls in the Stage view when using the Layer Transform tool on a layer. The controls are displayed by default. 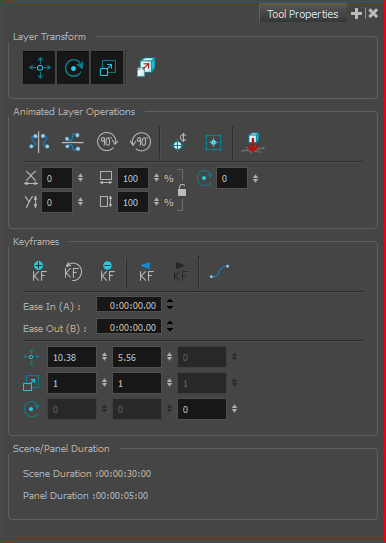 Shows or hides the scale controls in the Stage view when using the Layer Transform tool on a layer. The controls are displayed by default. Lets you snap a 2D layer or 3D model to a 3D surface and manipulate it. The Reset Pivot button resets the current layer’s pivot point to its original position at the centre of the camera frame. You can also select Layer > Pivot > Reset Pivot. By default, the pivot is positioned at the center of the camera frame. Use this button to set the pivot at the centre of the selected layer. You can also select Layer > Pivot > Center Pivot on Selection. Lets you snap a layer to the surface directly below it The angle of the layer is retained and the lowest point of the layer will connect to the surface. Lets you enter a value to reposition the selection along the X-axis. Lets you enter a value to reposition the selection along the Y-axis. Lets you enter a value to resize the width of the selection. Lets you enter a value to resize the height of the selection. Locks or unlocks the ratio between the Width and Height values. Lets you enter specific values to rotate the selection. A positive value rotates the selection counter clockwise and a negative value rotates the selection clockwise. NOTE This field is only available when working in 2D mode. Adds a keyframe to the selected layer. Resets all the position values to their defaults. Deletes the selected keyframe from the layer. Lets you set the velocity at which the layer movement begins. You can enter the duration of the ease in after the first frame in which the gradual change layer movement begins. For example, if you want to slowly accelerate to the normal layer speed from frame 1 to 10, enter a value of 10. Lets you set the velocity at which the layer movement ends. You can enter the duration of the ease out after the first frame in which the gradual change in layer movement begins. Enter the number of frames before the last frame in which the change in layer movement is gradual. Lets you position the layer along the X and Y axes. Lets you scale the selected layer vertically and horizontally. Lets you rotate the selected layer clockwise and counter clockwise.